First Engadget showed us a Windows Phone 7 beauty, the Dell Lightning, and now they're showing off Dell's Android offerings: Flash, Thunder, and Smoke. They're all lookers in their own ways and full of appealing features. 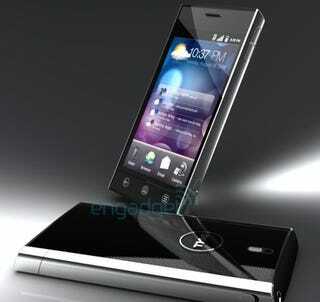 The Thunder has a 4.1-inch WVGA OLED screen to show off a "heavily' customized UI on top of Android 2.1. There aren't too many details on the device, but it sounds like it has a focus on social networking and video apps. The Dell Flash and Smoke are to run Android Froyo on a 800MHz Qualcomm MSM7230 processor, and offer 14.4Mbps HSPA. Both have rather odd designs—the Flash is described as "curved glass"—but they're both look like they'd slip into your pocket nicely.